Since then, Evie has done six different shows at three different theaters, as well as a voiceover for a movie. Ellie has done nine different shows at five theaters, a voiceover for a movie, a music recording, a viral flash mob, and has even sang on live TV for FOX News. Perhaps most notably, Ellie played Young Cosette in the Orlando Shakespeare Theater’s production of Les Miserables, which ran from September to October of 2014. Both girls are very serious about their acting careers and plan on continuing. The sisters have different approaches to acting though. Evie said she handles her nerves by connecting with the audience, while Ellie becomes the character so much that she forgets about herself. “I’m so into being the character that I am not nervous at all,” said Ellie. When it comes to preparation, Evie prefers practicing at home and going to each rehearsal. Ellie also practices at home and rehearses, but also really relies upon the director for character cues. Both can come to an agreement on acting as a family though! 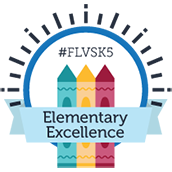 Both young ladies, as well as their younger brother, are students of the FLVS Full Time program. 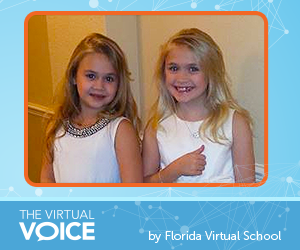 Both girls started in Kindergarten and are supported by their father, who is a social studies teacher at FLVS. They both think that FLVS FT has been a beneficial schooling system for them. FLVS wishes both young ladies good luck in their acting careers and are so proud to have them as students of our school! 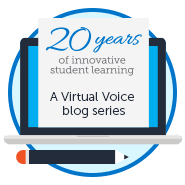 This entry was posted in Full Time Edition, Student Edition and tagged Acting, Family Activities, FLVS FT, FLVS Full Time, Student Activities, Student Actors, Student Experience, Student Spotlight, Student Success, Student Voice on March 4, 2015 by Guest Blogger. They are so lucky. I have a very strong love for singing,acting, and dancing. It is good that they get this chance at such a young age. You girls did a great and awesome job. Keep it up! Congratulations, girls! Definitely continue with what you do. Good luck in your future careers! OMG ! they are so adorable ! congrats , congrats , congrats ! congrats on your success , and being offered the Student Spotlight ! fantastic jobs ! I agree , also , with Jim … adorable names ! impressive, most impressive! good job, little ladies! good job and good luck!